When you add a service to Current RMS, you can specify bookable resources that are available for it – these are people, vehicles, or venues that can be used to fulfil the service. For example, a service called “Delivery” might have vehicles as bookable resources, and “Technician” might have staff members. What is a service overbooking? As with products, Current will let you know if you have shortages for a service on an opportunity. This will typically happen when you don’t have enough staff members, vehicles, or venues available at the time of the service booking to fulfil it, e.g. all of your vehicles are busy and your staff are booked on other jobs. Shortages will be highlighted in red in the opportunity items list. Why turn off service shortage tracking? You might add all transport services to opportunities with the hours of 9am to 5pm as you offer a delivery window. One vehicle might make all of the deliveries during this window, so that vehicle will show up as overbooked. If you’re getting started with Current, you might not want to take advantage of staff and vehicle tracking straight away. 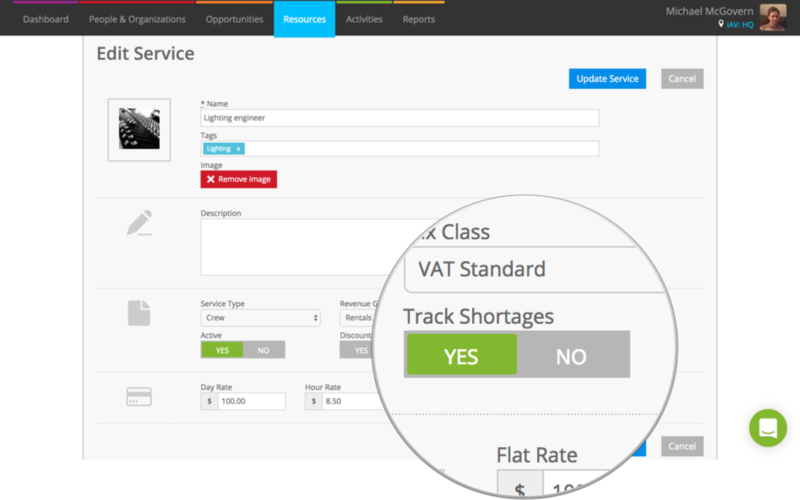 Shortage tracking can be turned off by editing each service. Head to Resources > Services and click into a service. Then, edit your service using the pencil icon at the top. Toggle “Track Shortages” to NO and hit the blue Update Service button. Repeat this for each service that you’d like to switch off shortage tracking for.